I don't know about you but I have a few children that LOVE helping in the kitchen. If they hear the drawer open that contains my measuring cups, they come running and want to help bake whatever it is I am baking. This cookbook looks nice and I would love to add it to my recipe book collection. 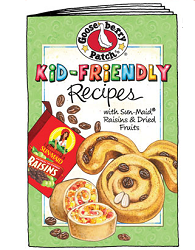 So, go ahead and get your very own FREE Gooseberry Patch Kid-Friendly Recipes Booklet! Click HERE for this freebie.